Chris Takacs reports: "Northern Shrike was seen by many today around 11:30 along Disposal Road outside DeKorte Park in Lyndhurst. It was seen halfway between the carillon and the entrance to DeKorte. 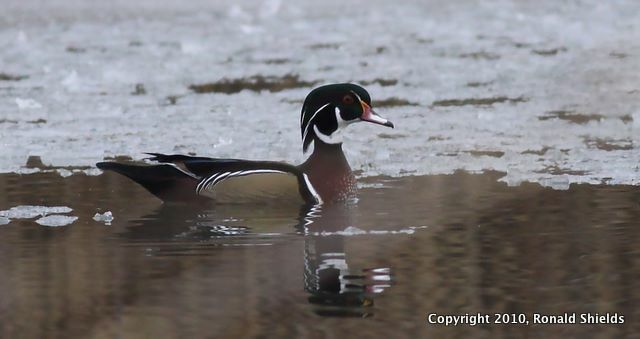 It flew off to the Saw Mill Trail after providing good looks to many birders." Thanks, Chris! Julie McCall reports: “I ventured out in the snow Thursday morning to see what might be around Disposal Rd. and DeKorte, from about 10:30 a.m. till noon. "No positive sighting of the shrike, just a "maybe" flying behind the retention pond, that I couldn't verify due to distance and the falling snow; it might have been a mockingbird. I also saw no sign of the Merlin that's apparently been in the area during the past week. "In DeKorte: Downy Woodpecker, White-throated Sparrows, Canvasbacks, Buffleheads, Mallards, Gadwall, Canada Geese (couldn't get good enough views to look for the possible Cackling Goose), Northern Harrier.